The most important rap song of 1997 was “Can’t Nobody Hold Me Down,” by Puff Daddy. Let me explain. The City University of New York Tragedy. In 1991, nine people were trampled to death at an overcrowded celebrity basketball game at the City University of New York, organized, in part, by Puff. This one generally only comes up if you happen to be writing about him or producing a documentary about him. But if you do happen to be doing one of those two things, it comes up a lot. It’s part of his complicated history with death, which he always appears to be trying to outrun. The Name Changes. This one generally comes up sarcastically, and usually in a way that’s meant to be funny but never, ever is. It’s often in a sentence that ends with some form of “...or Diddy or Puffy or Puff Diddy or Diddy Pops or whatever it is he’s calling himself these days.” It’s usually delivered by a mom or a dad or a friend who nobody likes. The Notorious B.I.G. This one comes up all the time. And it should, because it’s the most important. Puff and Biggie are tied together in history almost inextricably. The exchange of influence and skill and ideas that occurred between them, especially as it relates to the West Coast–East Coast rap rivalry that punctuated the mid- to late ’90s and all of the tributaries that stem off that, is a labyrinth, and a true chore to attempt to detail within the confines of a chapter in a book, and basically impossible in just one paragraph in the intro of a chapter. Puff Daddy interned at a company called Uptown Records. He was brought on as an employee. He was fired. He attempted to start his own label. He backed his way into finding the Notorious B.I.G. He heard him. He loved him. He signed him. They put out Ready to Die as the first album on the new label (Bad Boy Records). It eventually went quadruple platinum. More Bad Boy albums came. And they sold very well, too. None were ever as impactful as Biggie’s, though. To be stylistic about it: Puffy was the face, but Biggie had become the voice of Bad Boy. And then, in 1997, he was murdered. Puffy had been a successful producer, and had operated as the head of a successful label, and had even rapped a tiny amount, but nothing he’d done without Biggie touched anything he’d done with Biggie. Plus, for as much as he’d made himself visible in his artists’ videos, he’d never been a solo act. That’s why when Biggie was gunned down, most assumed Puff’s career was going to shrivel up and die right along with him. Then “Can’t Nobody Hold Me Down” came out. “Can’t Nobody Hold Me Down” was Puff’s first solo song. It sold more than four million copies and was a Billboard number one for six weeks. Part of the reason it was so successful is that it was so instantly likable, and part of the reason it was so instantly likable is that it was instantly recognizable. To make it, Puff doctored up Grandmaster Flash’s 1982 hit “The Message.” Ice Cube had tried something similar with “The Message” on 1992’s “Check Yo Self,” and that was a fine enough song, but even over that very pop-oriented production he still sounded too rugged. Puff’s talk-rap style was perfect for it. His version was warmer, smoother, easier to digest. And he doubled down on the nostalgia, too: In addition to sourcing “The Message,” “Can’t Nobody Hold Me Down” also incorporated part of Matthew Wilder’s 1983 hit “Break My Stride” for the chorus. He even aligned himself with the ideological core of the song. To wit: In the opening of “Break My Stride,” Wilder sang about an unfavorable exchange he had with a woman (he dreamt he sailed to China to be with her, but that she said she had laundry to do), and he did so as a way to say that he was a strong person and this wouldn’t break him (“Ain’t nothin’ gonna break my stride / Nobody’s gonna slow me down”). Puff’s initial argument was the reverse (I’m great and people are envious of me), but the end point was the same (others couldn’t stop him). The video for “Can’t Hold Me Down” was an opulent ode to itself, which is to say it was a standard Bad Boy video. The most memorable portion was Puff and Mase driving around the desert in a Rolls-Royce looking not all that impressed with driving a Rolls-Royce around in the desert. Later, they blow the car up because they get bored with it. And then in the next scene they’re dressed in all white in an all-white room with no furniture or furnishings, because colors and chairs are boring, too. The whole thing felt like the inverse of Tupac and Dr. Dre’s “California Love” video, a Mad Max–themed ode to anarchy that consisted of makeshift cars being driven around the desert. So for his first song Puff just redid what he’d done as a producer (sample famous songs people recognized) and redid what he’d done as a video coordinator (spend a lot of money), and I think we’re all feeling pretty foolish for having not been able to see that he was going to be just fine without Biggie. The dominance of Puffy: The song that followed “Can’t Hold Me Down” on top of the Billboard’s Hot 100 was “Hypnotize” by the Notorious B.I.G., which is the most perfect example of Bad Boy’s We Have Money, Life Is a Party mission statement. It was there for three weeks. Hanson’s ridiculous “MMMBop” ba-duba-dopped its way to the top for three weeks (Puff did not produce that one, turns out). After that, it was “I’ll Be Missing You,” a tribute song to the Notorious B.I.G. by Puff, Faith Evans, and 112. It was at number one for 11 weeks. “Mo Money Mo Problems” was next (by the Notorious B.I.G., Puff, and Mase). It was there for two weeks. And then “Honey” by Mariah Carey came after. It was there for three weeks. Puff produced that one, too. That’s a stretch of 25 out of 28 weeks where Puff Daddy was, in part, responsible for the number-one song in the nation, and he’d spread it over five songs. It had never happened that way before. It hasn’t happened that way since. If we can go broader: “Can’t Nobody Hold Me Down” was the first single from Puff’s debut album, No Way Out. The album sold more than seven million copies. The six albums that had come before it on the Bad Boy label: the Notorious B.I.G., Ready To Die (4x platinum); Craig Mack, Project: Funk Da World (gold); Faith Evans, Faith (platinum); Total, Total (platinum); 112, 112 (2x platinum); the Notorious B.I.G., Life After Death (10x platinum). And the next 20 that came after No Way Out on the Bad Boy label were also all certified gold, platinum, or multiplatinum. Puff even managed to sell 600,000–plus copies of Da Band’s album. That’s the most amazing thing. Do you remember Da Band? They were a group formed on a reality TV show called Making the Band on MTV. The only thing anyone seems to know about them today is that Dave Chappelle made fun of one of the members one time. Puff Daddy is a genius. There are two ways to view Puff Daddy’s legacy. He is either (a) one of the most successful persons in rap, with an influence and an impact on music history that is unquestioned and unending, and that is incredible. Or he is (b) one of the most successful persons in rap, with an influence and an impact on music history that is unquestioned and unending, and that is incredible, but a steadier look outside of the jet stream of his propulsion toward the sky shows a littering of discarded acts who are irrelevant, broke, incarcerated, or dead, and that is not incredible. Either way, “Can’t Nobody Hold Me Down” plays an essential role in his legend, and his legend is essential to rap. 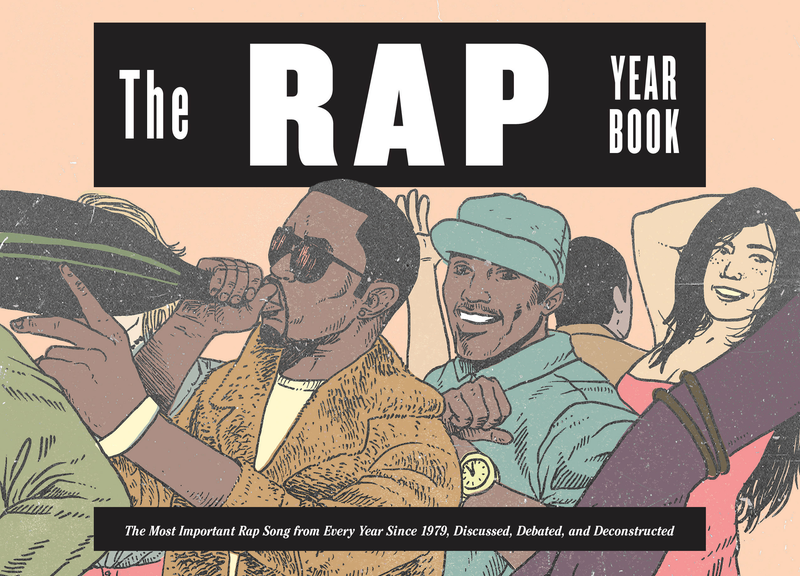 Excerpted with permission from The Rap Year Book: The Most Important Rap Song From Every Year Since 1979, Discussed, Debated, and Deconstructed, out tomorrow via Abrams Image, written and illustrated by Shea Serrano. Shea Serrano is an award-winning music critic and illustrator whose work has appeared at GQ, Rolling Stone, MTV, ESPN, VICE and more. Currently, he is a staff writer for Grantland. His first book, Bun B’s Rapper Coloring and Activity Book, came out in 2013.